Nothing says "Happy New Year!" like Surf and Turf. 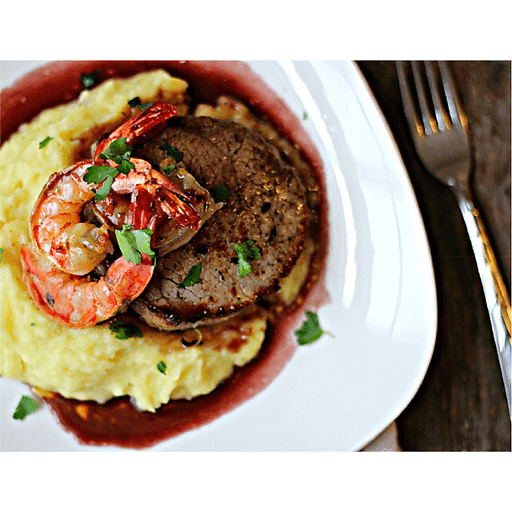 We've got a recipe featuring tender sirloin steaks and jumbo black tiger shrimp with a sauce of earthy fresh thyme, red wine, beef stock, shallots, oil and butter. 1. Rub steak with coarse salt and black pepper. Let steak stand at room temperature 30 minutes. 1. Heat half the oil and thyme sprigs in medium nonstick skillet over medium-high heat. Add steak and cook to desired doneness (3 to 4 minutes per side for medium-rare). Transfer steak to plate. Add remaining oil to skillet and add shrimp. Sauté 1-2 minutes, until cooked. Remove from pan. Add shallot and sauté until slightly softened, scraping up browned bits. Add wine and boil until liquid is reduced by half, stirring often, about 1 minute. Add broth and boil until sauce is thickened, about 2 minutes. Whisk or swirl in butter. Season sauce with salt and pepper. 1. Cut steak against grain into ½ inch- thick slices. Serve with shrimp and sauce. Serve over a bed of Parsnip, Yukon & Herb-Oil Mash. Search for the recipe on this site. Per Serving: Calories 370, Total Fat 23g (Saturated 8g, Trans 0g), Cholesterol 105mg, Sodium 310mg, Total Carbohydrate 4g (Dietary Fiber 0g, Sugars 1g), Protein 25g, Vitamin A 4%, Vitamin C 2%, Calcium 2%, Iron 15% *Nutritional values are an approximation. Actual nutritional values may vary due to preparation techniques, variations related to suppliers, regional and seasonal differences, or rounding.